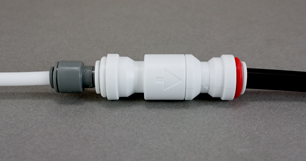 The Airgap Faucet Adapter is a simple check valve that makes the use of an air gap faucet unnecessary. The white tube represents the small drain tube that comes out of the membrane housing and goes up to the faucet. The black tube is the 3/8" tube that runs between the base of the air gap faucet and the drain saddle. The only tool you'll need is a pair of scissors. Just clip at a convenient place, making a good square cut. Then join the two tubes together with the adapter. No special elevation or placement is needed. After installation, your faucet will have only one tube (in most cases a 1/4" tube) that connects it to the “permeate” product water (the water you're going to drink) of the RO unit.